Over the last several tutorials we have done some really fun quilts. We used many different designers and some fabulous bloggers lent their talents and made some beautiful one of a kind patterns. Our last jelly roll tutorial was amazing and I want to congratulate Debbie Smith who posted her finished quilt top to our Flickr page to win a red, white and blue fat quarter bundle!! For the next several tutorials, we are going to take a break from quilting and complete some other simple fun projects. These projects should be kept in the back of your mind for easy reference and will be able to be made quickly for gifts or even for a new look for yourself or home. 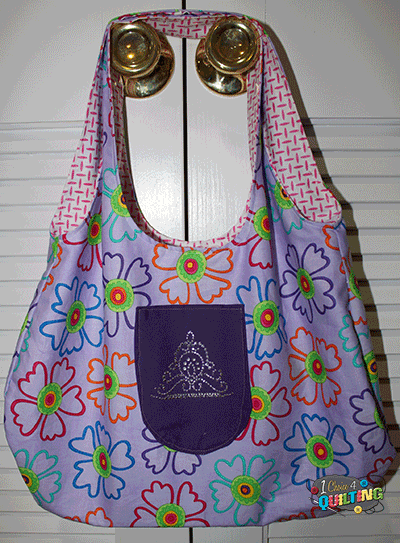 As I researched online looking for a great pattern I came across a blog by Novita at verypurpleperson.com. With her permission I am sharing her free pattern and instructions. There are two fabric choices you can go with here. 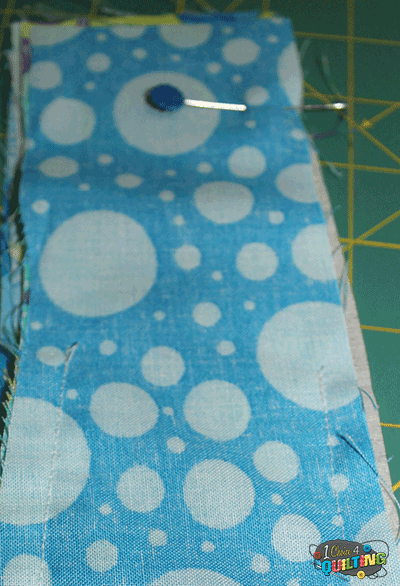 You can chose a heavier fabric or go with cotton with some interfacing as we are doing here. 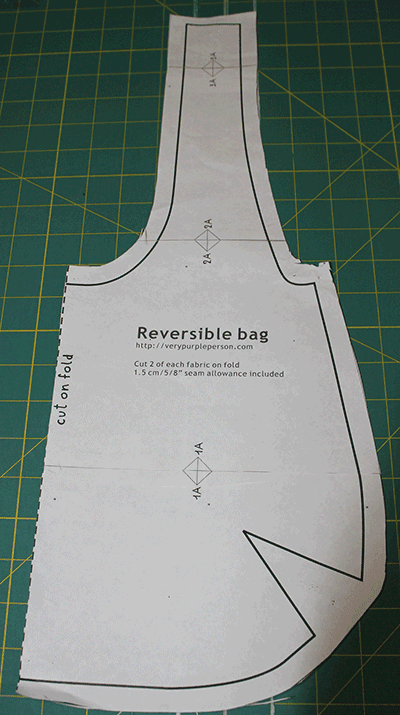 Your first plan of action is to download and print the Reversible Bag Pattern. Get it cut and taped together. 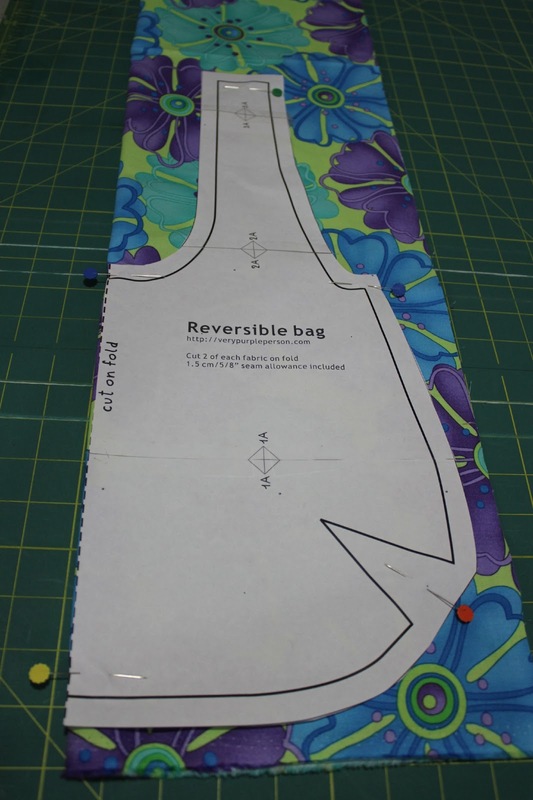 You can also download the Reversible Bag Instructions courtesy of verypurpleperson.com as well as follow along here. I have added some modifications that worked really well for me. In your kit you received two 1/2 yard cuts. 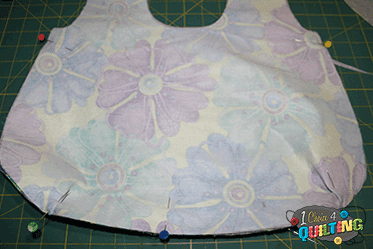 Fold them lengthwise and pin the pattern to 1/2 and cut your fabric. You will repeat this 4 times and again twice for the interfacing if you choose to use it. Now that little piece that you cut off just before you cut the second piece is the perfect size for the front/inside pocket. Save that to the side. You should now have 4 pieces of equal proportion. Grab that little piece you saved to make a pocket. All I did was fold it in half, print sides together and sewed completely closed, locking my stitch at the beginning and end. Cut the excess off to round the bottom. I then made a straight cut across the top and turned right sides out. Iron flat with 1/4 inch seams folded in at the top. Sew straight across to seal top. 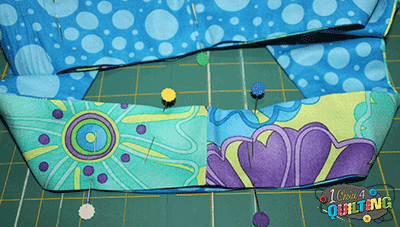 Pin the pocket to the front of on half of your purse. Sew around the outside and wa la....you've got yourself a pocket. Trust me it's better to decide you want the pocket now. 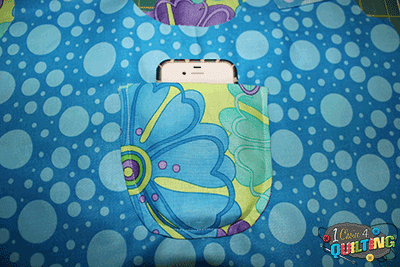 This pocket is just the perfect side for a cellphone. I like mine to be easily accessible. I used the reverse prints as the pockets and I love how it came out. 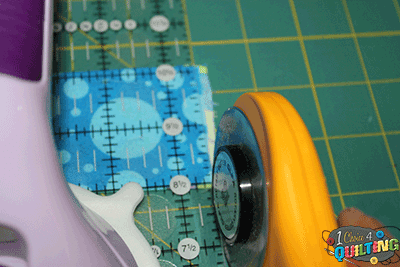 Your next step is to apply the interfacing on the back side of one the set of prints. If you purchased the kit your interfacing came with instructions. Feel free to use them. 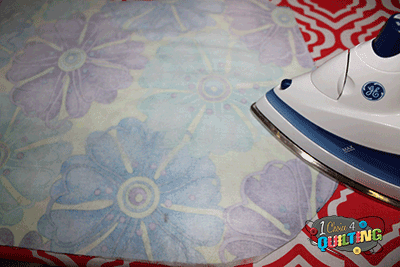 I need a new iron so I found it took me a little longer than it should so depending on your iron type be patient. I needed steam and alot of it!! Now pin your two pieces print sides together. Sew together only the bottom edges as stated in step 2 of the pdf. Repeat for non-interfaced set as well. Put the two sets into each other still working with the wrong sides. And sew the top and the straps together but be sure to leave them open by about 4-5 inches as in step 3 of the printed pdf. Turn your bag right side out through one of the straps. If you used interfacing, this will be a little tougher but take your time because the extra support will be well worth the extra effort. You're almost there! Now to complete the straps! Double check that all of your straps are the same length. This is important for making sure you have a flawless finish =) If you need to cut off any excess as shown below. Now you can sew each strap together making sure you are sewing the right straps together!! Iron all the sets down and pin the straps together. 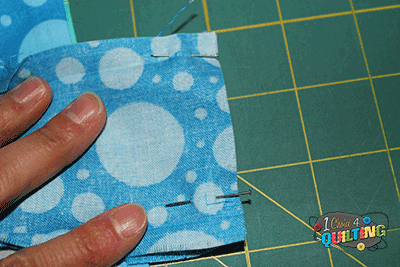 Fabric Glue or fusible tape works well too but pinning is usually my method of choice. 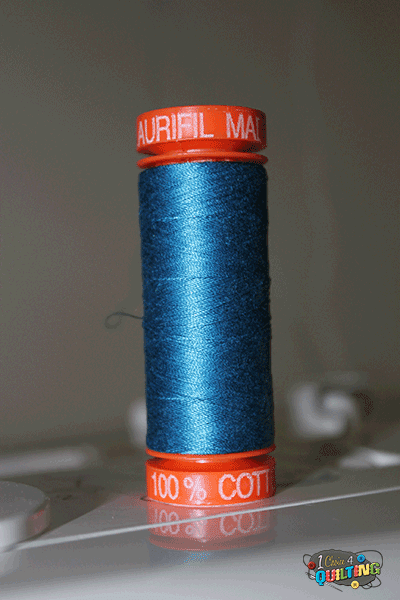 Having received several aurafil thread spools at the Quilt Market last month, I decided to grab a beautiful turquoise blue that matched perfectly. I stitched the remaining tops of the straps together taking my stitching all the way around the fronts, sides and straps of the bag to give it a finished look. I absolutely love the way my bag turned out. I plan to make several more with varying collections. Why not? A girl can never have too many bags, right? Please comment below with any questions you run into. Post your finished back on the Flickr page or on Instagram @1choice4quilting. Thanks for Quilting Along! Hope everyone has fun!! Me & My Sister Designs Giveaway Winner!! 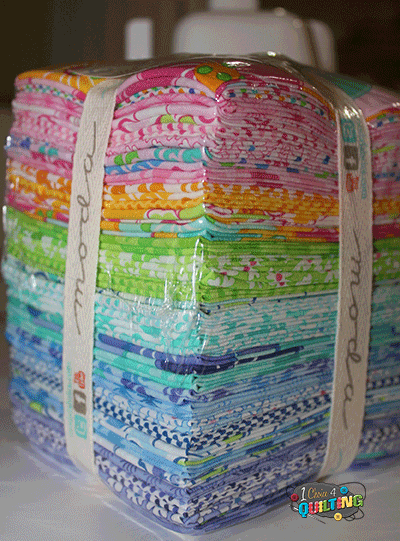 WOW...today was the last day of school and a big day for the 1 Choice 4 Quilting giveaway. Today we name three winners for three items from Me and My Sister Designs. 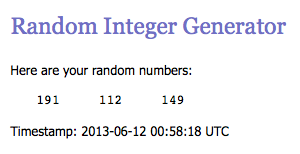 The winners have been chosen! I used Random.org to determine the winners. 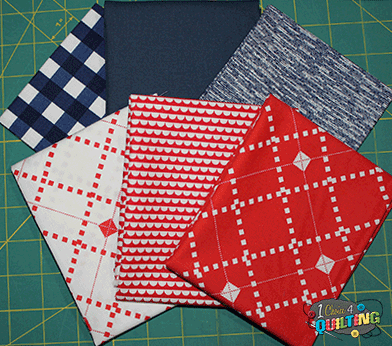 The Second item is a Reversible Bag Kit for the Quilt Along that will start on Monday! Winner can choose from 5 different color combos! Kits are available for purchase at just $14.99. The Third Item is a 1/2 yard bundle of 4 different Me & My Sister Designs prints. Winner's Choice. The winner's will be notified via email. 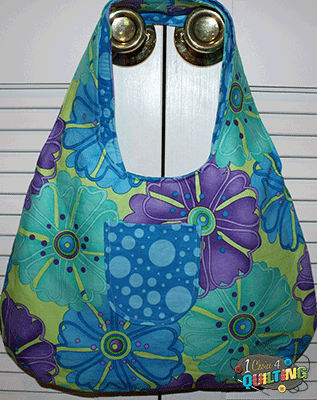 Want to still purchase a Ticklish Reversible bag kit? They are still available in five different combinations! The tutorial will be posted tomorrow! I hope you'll join in!! Me and My Sister Designs Feature and Giveaway with Three Lucky Winners! From the moment I set eyes on the fabric collections of Me and My Sister Designs, I feel in love. From the Vibrant colors to the cheerful flowers, fun shapes and cute patterns I knew that anytime a collection was to be released, I had to have it! Me and My Sister Designs consists of sisters, Mary and Barb, who not only design for Moda Fabrics but also have patterns and books that they have published. I had the pleasure of meeting Barb and Mary at the International Quilt Market last month and they were so sweet. They even signed my book Three Times the Charm. What fun! purchase and you will be the first to know when it arrives. There other recent collections are just as charming. Amelia which is still available in limited quantities of yardage had great bright blues and hot pinks. The mini flowers were fun pops of little daisies and no collection of their has been complete without dots. Then came Shades of Black...and I thought wow....different but what a fabulous idea. I personally love the idea of a black and white quilt having recently made one for my daughter teacher as an end of the year gift. Sisters, Mary and Barb, took all of the fun patterns of the past and redesigned them into shades of black, white and gray. Here is what I love about a black and white quilt....you can add really fun pops of color on the front, either as part of the pattern or appliqued, as the backing or binding. The possibilities are endless. Pre-cuts avaiable now. And now onto the giveaway! To celebrate Me and My Sister Designs and the fabulous work that they do, not only is everything on sale through Tuesday June 11th, 1 Choice 4 Quilting will give away three items from Me and My Sister Designs. Now this should be fun!! You can enter up so many different ways. Enter once or all the ways to increase your chances! 1. Please leave your first comment by sharing with us....What is your favorite Me and My Sister Design Collection? Mine is definitely the upcoming Giggles Collection. I can't wait to read your comments! 6. I love Instagram! Do you love it, do you follow 1 Choice 4 Quilting. Let me know or start following! It's so fun!Photos really do say 1,000 words. 7. If you Blog about our giveaway and tell all of your friends, please leave us a comment letting us know you did with the URL of your blog post. We REALLY appreciate our bloggers AND I will email you 5% off coupon!! 8. If you blog you can add our button to your blog. You can grab our button here! Then leave us another comment letting us know you have! Interested in the button earning you free fabric, check out our affiliate program. 9. You can also join our Newsletter to receive all the current releases, special discounts and more! Then leave us another comment letting us know you did! I hope you'll join in the fun!! This giveaway will end Tuesday 6/11/13 at noon and I will announce the Winner by 4 pm EST on 6/11/2013. I will post the sewalong on Monday for those who want to get head start. 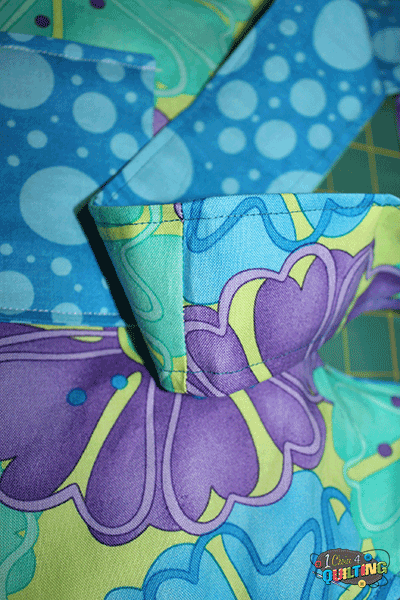 All fabric is shipped quickly and will arrive in 2-3 days!